SOLDIERS BY NAME Armstrong, George A.
George A. Armstrong was born on August 27, 1830 in Peru, New York. He was residing in Eaton Rapids, Michigan when he enlisted in the 7th Michigan Cavalry Company D on November 11, 1862 at Grand Rapids, Michigan. He was mustered into service as a 32 year old Captain that same day. 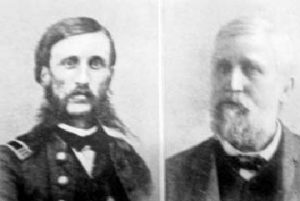 On May 18, 1864, he was promoted to Captain and Assistant Quartermaster. He was mustered into the U.S. Volunteers Quartermaster’s Department on May 25. George A. Armstrong was discharged from service on March 13, 1866 at Washington, D.C. After the war, he lived in Fresno, California.